This is the documentation for the mxODBC Zope DA in HTML format. This manual describes the eGenix.com mxODBC Zope Database Adapter (DA) for the Zope Application Server. The mxODBC Zope Database Adapter (DA) gives you a professional quality Zope ODBC interface which allows you to easily connect to any ODBC data sources you have configured on your system via the Windows ODBC Manager on Windows or iODBC/unixODBC ODBC managers on Unix platforms. The mxODBC Zope DA package includes everything you need to install the Zope DA: the latest egenix-mx-base and egenix-mx-commercial packages as well as the mxODBC Zope DA product itself. ZODBC DA. This is especially useful for heavily loaded sites. ● Works on Windows and Unix platforms without change. ● Fully compatible to Z SQL Methods. ● Fully compatible to the Znolk SQL Wizard Product and other similar Zope Products relying on the common database schema access methods .tables() and .columns(). ● True Parallel Execution of Queries on a single logical connection: the mxODBC Zope DA can manage any number of physical connections on a single logical connection. This enables running truly parallel Z SQL Method queries - a feature not available in other Zope DAs which often serialize the queries. ● Robust Mode of Operation: connections which have timed out or go away due to network problems are automatically reconnected. ● Direct Database Schema Access: all ODBC catalog methods are made available for much better database schema inquiry. The catalog methods allow building generic database interrogation or manipulation tools and facilitates writing database independent Zope products. ● Transaction Safe Automatic Reconnect: when the DA finds that a connection has timed out, it automatically tries a reconnect and replays the transaction on the connection (unlike other DAs which break the transaction scheme by trying a reconnect without replay). ● Customizable to many different ODBC drivers: ODBC is a complicated standard and the levels supported by existing ODBC drivers vary greatly. The mxODBC Zope DA provides several connection options which can be used to enhance the compatibility of the interface to the used drivers. ● All Windows platforms starting with Windows 98 are supported. ● Zope 2.3 or later needs to be installed and working. eGenix.com distributes the mxODBC Zope DA as bundle of the eGenix.com mx Base Package (egenix-mx-base), the eGenix.com mx Commercial Package (egenix-mx-commercial) and the mxODBC Zope DA Product in form of binary archive files. You can download the binary archives for your combination of platform, Python version and Unicode variant from the eGenix.com web-site at http://www.egenix.com/. On some platforms we support x86 32-bit and x86_64 (AMD64/EM64T) 64-bit versions of Python. ● the Zope Instance directory (Zope's INSTANCE_HOME) which we'll call <Zope Instance Directory>/. You can run multiple Zope instances with just one installation of the Zope Software. Since the mxODBC Zope DA is licensed per Zope Instance and because it is good practice to not install anything into the Zope Software directory (where the main Zope software resides), you are advised to install the mxODBC Zope DA in the Zope Instance directory (the directory from where you start your Zope instance by running ./bin/runzope on Unix or .\bin\runzope.bat on Windows). The binary installation archives include everything you need to run the mxODBC Zope DA, including the necessary egenix-mx-base and egenix-mx-commercial packages for Zope. If you already have a directory named "<Zope Instance Directory>/lib/python/mx" in your Zope Instance directory, be sure to rename this to some other name, e.g. "<Zope Instance Directory>/lib/python/old-mx" before installing the binary packages. If you don't, the binaries that come with the mxODBC Zope DA will overwrite files from the existing installation of egenix-mx-base/egenix-mx-commercial which can result in a malfunctioning mxODBC Zope DA installation. When upgrading from a previous version of the mxODBC Zope DA, you should rename the "<Zope Instance Directory>/Products/mxODBCZopeDA" product directory to a different name, e.g. "<Zope Instance Directory>/Products/old-mxODBCZopeDA". That way you can restore the previous installation in case something should go wrong. In order to install the license files, please unzip the license archive to a temporary directory. During the installation process you will have to move the files to the right location in your Zope Instance directory for the mxODBC Zope DA product to pick them up during Zope startup time. Unzip the binary distribution archive in the Zope Instance directory <Zope Instance Directory>/, i.e. where you find Zope's lib/, bin/, etc. directories. To unzip a binary package you can use common tools such as Winzip on Windows or Info-ZIP's Unzip on most other platforms. Depending on the permission settings on the target machine, you may have to use an admin or rootaccount for the unzipping step. This is needed starting with Zope 2.7, since Zope no longer scans the lib/python/ directory for products. (note that on Windows, the forward slash has to be replaced by a backwards slash). Now that you have installed the product code, you need to install the proper licenses in order for the mxODBC Zope DA to startup correctly. Go to the temporary directory where you unzipped the license archive and change to the license subdirectory which contains the license for the Zope Instance that you are currently working on. Copy the two files license.py and license.txt from the license subdirectory to the directory <Zope Instance Directory>/lib/python/mx/ODBC/ in your Zope Instance installation. To complete the installation, restart the Zope instance. Zope will then automatically register the eGenix mxODBC Zope DA. The standard installation installs into the <Zope Software Directory>/lib/python directory where <Zope Software Directory>/ is the directory where your Zope software is installed (Zope's SOFTWARE_HOME). Unlike more recent Zope versions, Zope versions 2.3 through 2.6 do not make a distinction between a "Zope Instance" and the "Zope Installation", thus each instance you setup will require a complete Zope installation and everything resides in the same directory - the <Zope Software Directory>/. If you already have a directory named "<Zope Software Directory>/lib/python/mx" in your Zope installation, be sure to rename this to some other name, e.g. "<Zope Software Directory>/lib/python/old-mx" before installing the binary packages. When upgrading from a previous version of the mxODBC Zope DA, you should rename the "<Zope Software Directory>/lib/python/Products/mxODBCZopeDA" product directory to a different name, e.g. "<Zope Software Directory>/lib/python/Products/old-mxODBCZopeDA". That way you can restore the previous installation in case something should go wrong. Binary distributions of the package can simply be unzipped in the Zope Software's home directory (which we'll call <Zope Software Directory>/), i.e. where you find Zope's lib/, bin/, etc. directories. To unzip a binary package you can use common tools such as Winzip on Windows or Info-ZIP's Unzip on most other platforms. Copy the two files license.py and license.txt from the license subdirectory to the directory <Zope Software Directory>/lib/python/mx/ODBC/ in your Zope Instance installation. To complete the installation, restart the Zope server. Zope will then automatically register the eGenix mxODBC Zope DA. These installation instructions are for Plone 2.x on a Mac OS X system. We assume that you have installed Plone using the standard Plone installer for Mac OS X. You can run multiple Plone sites with Plone. Each of these sites is run using an instance of Zope, the underlying application server engine of Plone, a so-called Zope Instance. 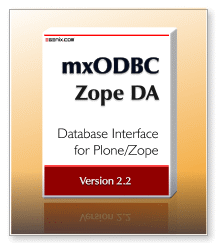 Since the mxODBC Zope DA is licensed per Zope Instance and because it is good practice to install per-instance products in the Zope Instance directory, we will describe the process of installing the mxODBC Zope DA in the Default Site of Plone. This is usually located under the file path/Applications/Plone2/Sites/Default on your server. If you wish to install the mx ODBC Zope DA for a different site, please change the path from …/Sites/Default to the path of the site you wish to target with the installation. If you already have a directory named "/Applications/Plone2/Sites/Default/lib/python/mx" in your Zope Instance directory, be sure to rename this to some other name, e.g. "/Applications/Plone2/Sites/Default/lib/python/old-mx" before installing the binary packages. When upgrading from a previous version of the mxODBC Zope DA, you should rename the "/Applications/Plone2/Sites/Default/Products/mxODBCZopeDA" product directory to a different name, e.g. "/Applications/Plone2/Sites/Default/Products/old-mxODBCZopeDA". That way you can restore the previous installation in case something should go wrong. Download the distribution archive from the http://www.egenix.com/ web-site. Be sure to select the Mac OS X download. Unzip the archive to a temporary directory on the installation machine. We'll use the directory /tmp/egenix in our example. This will create a new directory /tmp/egenix/lib with the software. Unzip the licenses.zip attachment from the license email to the same directory. This will create at least one new directory with the license key as name, e.g. /tmp/egenix/1111-2222-3333-4444-5555-6666. Delete the temporary directory /tmp/egenix. Restart Plone. If your Plone installation start at boot time, it is easiest to reboot the machine. Test the new product. Please see section 3 for details on how to configure the product. These notes apply on all platforms. The mxODBC Zope DA implements its own connection pooling. It is therefore not required to turn on connection pooling in the ODBC manager. In fact, this may even sometimes result in strange effects, very slow connections and errors due to the state stored on the pooled connections. Alternatively, you can use the iODBC/unixODBC management GUIs which allows setting up data sources in the same way as the Windows ODBC manager provides on Windows. Note that you only need to have one of these two ODBC managers installed on the installation machine for the mxODBC Zope DA to work. The Zope DA will print out messages at Zope startup time which inform you about the successfully added interfaces for iODBC and/or unixODBC. It will issue a warning in case both interfaces fail to load. In that case, please make sure you have correctly installed the ODBC manager and that the Zope user account is setup to find the shared libraries provided by the ODBC manager of your choice. On Unix the mxODBC Zope DA uses an already installed iODBC and/or unixODBC manager to communicate with the installed ODBC drivers. If you use recent versions of the iODBC and/or unixODBC managers, the last point is less likely, since eGenix always builds the binary distributions of the mxODBC Zope DA against the latest stable releases of these managers. The DB2 ODBC Driver for NT has an optimization option called "early cursor close" (or similar). This has to be switched off. Otherwise, you'll get lots of SQLSTATE 08001 or 080003 errors during connects and parallel execution of SQL Methods becomes impossible. Unfortunately, the driver's current versions (0.6x) are not yet suitable for production work because they lack support of many important ODBC features. To work around the showstopper bugs in the driver, eGenix has added a set of compatibility features to the underlying mxODBC interface to at least make the setup mxODBC Zope DA + FreeTDS driver usable for simple queries to the supported databases. See the mxODBC Documentation for hints on how to setup FreeTDS to work together with the mxODBC Zope DA. For production systems, we recommend deploying professional quality ODBC drivers to access MS SQL Server and/or Sybase, such as the ones available from EasySoft, OpenLink and DataDirect. Please note that most of the settings you make during the creation process can be adjusted after object creation in the Propertiesdialog. After installation and restart, the "Add Object" list box in the Zope management interface should show an entry "eGenix mxODBC Zope Database Connection". You can click on the "Available Datasources" link to get a pop-up window displaying the currently configured ODBC data sources. The list is fetched from the available ODBC managers and allows for easy cut&paste of the connection string. You only have to fill in the user id and password. Zope stores date/time values with an associated time zone. Even though the SQL standard defines date/time values with timezones, not all databases support this and the ODBC standard defines no interface to obtain this information from the database. By entering a timezone in the entry field you can define the timezone to be used for all date/time values fetched from the database, e.g. if you know that the data in the database is GMT, then you can have the Zope DA create Zope DateTime instances which use the GMT timezone. The Database Timezone entry field can also be left blank to assume the local timezone. Unlike some other Zope database adapters, the mxODBC Zope DA maintains the state you define here across Zope restarts. If you create an open connection, the Zope DA will try to reopen the connection after a Zope restart. A closed connection will not be opened after a restart. Hitting the Create Connection button will create the mxODBC Zope DA connection object, possibly trying to open the physical connections provided that you have chosen to create an open connection. You should then see a new connection object in the folder. The mxODBC Zope DA converts all mxDateTime instances fetched from the underlying mxODBC interface to Zope DateTime instances to maintain better compatibility to other Zope database adapters and to make migration to the mxODBC Zope DA easier. However, the Zope DA can also be configured to return mxDateTime instances directly. This also gives a small performance gain, since the Zope DA does not have to convert the mxDateTime instance it receives from the underlying mxODBC interface into Zope DateTime instance for every query. To have a connection return mxDateTime instances without conversion, enable the option "Fetch date/time columns as mxDateTime values". To have a connection return mxDateTime instances directly, please enable the option "Fetch date/time columns as mxDateTime instances" in the connection object management interface. The results should be displayed as table after pressing the execute button. Note that only the first 20 rows are displayed. ● Limitations of previous mxODBC Zope DA versions have been lifted. Fetch date/time columns as mxDateTime DateTime/DateTimeDelta instances. Fetch date/time values as mxDateTime instances. The egenix-mx-base part of the package (e.g. mxTextTools and mxDateTime) is distributed under the eGenix.com Public License and the egenix-mx-commercial (e.g. mxODBC) while the mxODBC Zope Database Adapter is distributed under the eGenix.com Commercial License. mxODBC Zope DA binary packages for Linux and Solaris only ship with the mx.ODBC.iODBC and mx.ODBC.unixODBC subpackages of mxODBC.